All Party Parliamentary Groups (APPGs) are the Westminster equivalent of after-school clubs – they bring together MPs, peers and industry on specific issues or themes that interest them. The APPG for Eggs, Pigs and Poultry is one such group that the NPA is part of, in conjunction with the British Egg Industry Council, the British Poultry Council and NFU, and given the significant developments in agricultural policy over the next few years, we are all working to increase the profile of this group in Westminster. There are many opportunities and challenges arising from Brexit that our sectors collectively face. Aside from being unsubsidised sectors, all three are at risk of seeing imports of lower standard products from outside the EU, alongside challenges posed by disease pressures, welfare concerns and antibiotic use. However, each of our sectors stand well positioned to make the most of new support policies under the Agriculture Bill, as well as building on our track record of exports outside of the EU. On October 22, the APPG met for its autumn reception in the Houses of Parliament, launching a document entitled Standing up for British Production. It provides a short overview of what the sectors are delivering for the British consumer and taxpayer – outlining our roles as employers, our export values and our total contribution to the British economy. 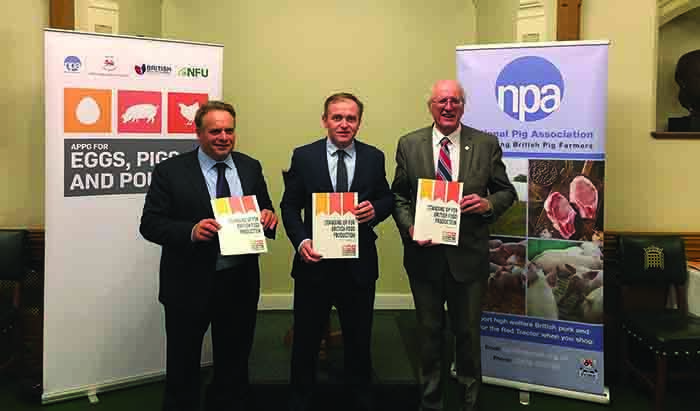 Defra Minister George Eustice spoke at the event, along with Neil Parish MP (Chair of the EFRA Select Committee) and APPG chairman Jim Shannon MP. Mr Eustice offered firm reassurances the UK would ‘not water down our standards on animal health and welfare in pursuit of a trade deal’ and said Defra’s proposed animal health and welfare scheme would not impose more regulation on farmers. The event was attended by members of the NPA’s Allied Industry Group and Producer Group, all of whom were able to speak with MPs about the key concerns affecting our sector, including Brexit and African swine fever. As ever we are very grateful to those members who made their way down to London and helped us get our messages out to policymakers at this important point for UK agriculture. Will Brexit posturing turn to compromise? As winter approaches, it is a little concerning that I am writing nearly the same column as I did this time last year. Given the fundamental divides in Government – and the Opposition – about the right course for Brexit, it is perhaps unsurprising that we are still in this hiatus. As I had mentioned last year, the Irish border will be the defining factor of Brexit as and when a deal is agreed. As it stands, it is holding up the negotiations – however, it is important to stress that it is holding up a transitional deal, not a final deal. The EU-27 are, in essence, saying that they need to sort out the Irish border in the event the transitional period (March 2019-December 2020) comes to an end before the border issues are finalised. This is what we know as the ‘back-stop’. Understandably, the EU and the Republic of Ireland want some kind of safety net on the border in the event that no deal is agreed after the transitional period. We are in the slightly farcical situation that the inability to sort this out could mean an immediate no deal in March 2019, and a hard border set up then – the very thing the EU wants to avoid in December 2020! Much of what I do is trying to make sense of Westminster for the benefit of NPA members, and even I struggle to explain the follies of this one. It goes to show that Brexit is a negotiation, with a fair bit of posturing between the parties. That is not to say that a compromise or agreement is straightforward – it really is not. You have Brexiteers, Remainers, Northern Irish Unionists and the EU all wanting very different things, and whatever decision is taken will inevitably upset one (if not more) parties. However, politicians, governments and the EU can be very flexible when the circumstances require (think Greece and the Euro) – it has been suggested that, if needs be, we could end up extending the transition period, or the UK could adopt a Norway-style approach as an interim measure until the key changes to borders, trade and immigration are put in place. A no deal is bad for everyone, that is something all sides can agree on (with some exceptions). As long as that mantra is held, we can expect to see a thaw over the coming months as posturing turns to compromise.